Habitat: Desert, Upland. It grows on rocky hillsides or in foothill washes or canyons. Description: The cup-shaped flowers are 1 1/2 inches (3.8 cm) wide and have 5 broad, white petals that fade to pink as they age. The petals are either solid white or streaked with pink at the base. 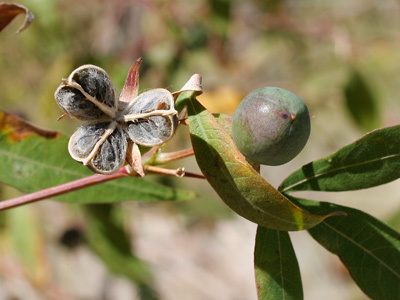 The flowers are followed by round, green seed capsules that dry to a brown color and split open to reveal the seeds and only a few, sparse cotton fibers. 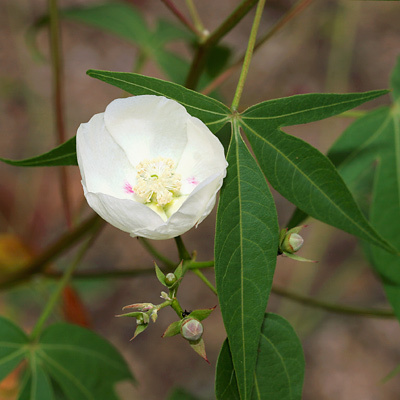 This plant is related to cultivated cotton, but its cotton is too paltry for commercial use. The leaves are green and palmately lobed with 3 or 5 point-tipped lobes. 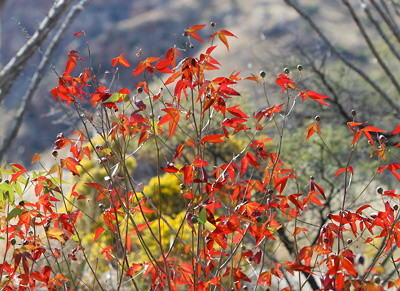 The leaves turn a bright red color in the fall (around late October).